Mzee Jomo Kenyatta is quite arguably Kenya's greatest and most beloved son thus far. Eventhough his physical presence is long gone, his vision for a unified and free Kenya lives on, and is a major source of inspiration not only for Kenyans, but all people of African descent. The name Kenyatta stems from the Swahili phrase taa ya Kenya which stands for the light of Kenya. Never more has someone been given a name more befitting his stature. Just as light shines in the dark, Kenyatta's vision shone so bright that it awakened Kenyans to the injustices of the British Colonial government and prompted them to fight for their rights. It was Kenyatta who assured Kenyans that they didnt have to be colonial subjects and that they could determine their destiny in their own way. Kenyatta was clearly a man of numerous talents. Not only was he a very charming individual, but was very articulate too. This fact made him a very formidable politician, because he always commanded the attention of his audiences. He was also a journalist, a scholar, a teacher, a biographer, a conservationist, but most importantly, the father figure Kenya desperately needed. As a journalist, he launched the first indeginous newspaper to voice Kenyan demands to the colonial govenment, and also to sensitize the public on their rights. As a scholar, he wrote the first serious study about his people, and as a biographer, documented the book suffering without bitterness. What Mzee accomplished was monumental, but what makes it even more mind-boggling is the time period in which he did it. His success despite such heavy odds is why he will forever be immortalized in African and World history books alongside other black nationalists like Kwame Nkrumah, Nelson Mandela, and Marcus Garvey, just to mention but a few. Kenyatta is believed to have been born sometime between 1889-1895 to Muigai and Wambui at Ng'enda, Gatundu Division of Kiambu District. His birth name was Kamau wa Ngengi. In 1909 he joined the Church of Scotland Mission, Thogoto, where he obtained his elementary education and training. After finishing his elementary education in 1912, he became an apprentice carpenter. In 1914, he was christened as John Peter Kamau, a name he later changed to Johnstone Kamau. The same year he set out to Nairobi to seek employment. In 1917 he evaded forced recruitment of able- bodied Kikuyu men by living in Narok and working for an Asian contractor. A Kikuyu by birth, he assimilated pretty well with the Maasai community living in Narok while working there. He would later get employment in Nairobi in 1918 as a store clerk. In 1919 he married Grace Wahu according to Kikuyu tradition, but would later get ordered by a European Magistrate in 1920, to follow Christian rites in marriage. In November 1920, he was blessed with a son, Muigai Kenyatta and 2 years later finally married Grace Wahu in a civil ceremony. In 1924, he started taking keen interest in the Kikuyu Central Association(KCA), a political party led by James Beuttah and Joseph Kangethe. By 1926 he had become the secretary of KCA helping them with translations and drafting letters. In May 1928, he started editing a Kikuyu Weekly Mwigwithania--which is Kikuyu for The Reconciler. It was printed by an Asian owned press, another testament to the fact that Kenyatta was a very embracing leader, willing to work with anybody, anywhere in the country. In 1929, KCA decided to send him to Britain to present African grievances before the colonial office. Indian leader and Legislative Council(LEGCO) member Isher Dass helped raise funds for his trip. On February 17th 1929, Kenyatta sailed out of Mombasa for Britain accompanied by Isher Dass, who was to petition on behalf of his Indian Community. They arrived in Britain on March 8th 1929. Soon after he arrived in Britain, he wrote the Give back our land articles in the English newspapers. In 1930, just before his scheduled return to Kenya, he wrote to the Colonial Office in Britain expressing fears of his arrest on return to Kenya. He also wrote about the unrest in Kenya in The Times and The Manchester Guardian. On September 24th 1930, he returned to Kenya. On May 2nd 1931, Kenyatta left Kenya again for Britain, to present KCA grievances to the colonial office. When his grievances were ignored by the colonial office, he decided to enroll at Quaker College, Woodbrooke. He completed his studies at Woodbrooke during the Easter of 1932. In August the same year, he left for Russia to start a one year course at Moscow University at the invitation of George Padmore , a radical West Indian. When Padmore got into a diagreement with the Russians in 1933, Kenyatta's studies are cancelled and he returns to Britain to pursue studies at University College, London. In 1936, while still studying in London, Kenyatta breaks through a police cordon at the London Railway Station to express solidarity with Emperor Haile Selassie of Ethiopia. In 1938 he publishes the book Facing Mount Kenya under the name Jomo Kenyatta. This would end up being his name henceforth. In Oct 1945, together with Kwame Nkrumah, they organize the Fifth PAN African Congress in Manchester with the slogans Freedom now and Africa for Africans. He came back to Kenya in September 1946, and in June 1947, becomes President of Kenya African Union(KAU) after Juntas Gichuru steps down for him. As leader of KAU he embarks on a massive campaign to sensitize the Kenyan public on the need to get their land and demand independence from the British. This takes place between 1948-1951. The Colonialists sensing Kenyatta's rising popularity, bans KAU, and this prompts the Mau Mau rebellion. On October 20th 1952, a state of emergency is declared and Kenyatta is arrested together with 182 other African leaders. At the infamous Kapenguria Trial he is charged with managing the Mau Mau. He is defended by a team of high powered attorneys including D.N. Pritt, QC Diwan Chaman Lall--an Indian attorney specially sent in by Indian Prime Minister Nehru, Kenyan-Indian lawyers F R S De Souza and A.R Kapila, and Nigerian Advocate H.O Davis. 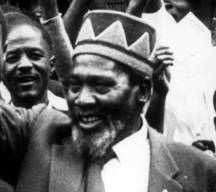 On April 8th 1953, Kenyatta is sentenced to 7 years hard labour and indefinite restriction thereafter. He is to serve his sentence at Lokitaung in North Western Kenya. On April 14 1959, he completes his prison sentence at Lokitaung but is restricted at Lodwar some 90 miles south of Lokitaung. In 1960, Ambu Patel, a follower of Mahatma Gandhi forms the "Release Jomo Committee" to drum up public support for Kenyatta's release. The same year, Kenyatta is elected Kenya African National Union(KANU) President in absentia. In March 23rd 1961, Kenyan leaders including Daniel arap Moi visit him at Lodwar. On August 14th 1961, Kenyatta is finally released and brought to his hometown Gatundu for a hero's welcome. The same year, he leads a KANU a delegation to Lancaster Conference in London. In May 1963, he steers KANU to victory in the polls and he becomes Prime Minister on June 1(Madaraka Day). "Madaraka" is Swahili for self-government. In August of the same year he gives an assurance to an increasingly worried white settler population that they can stay in Kenya and live peacufully with their African counterparts. This comes as a huge surprise to the settlers who were expecting Kenyatta to retaliate for the years he was incarcerated. But Kenyatta was too big for that. He urges Kenyans to forgive and but never forget, and to participate in the process of nation building. December 12th 1963, turned out to be a very significant day in the life of Mzee Kenyatta. On that day, he not only became Prime Minister of a free Kenya, but was also blessed with another son. He named his son Uhuru, which is swahili for freedom. December 12th, also referred to as Jamhuri Day has since been observed as a national holiday. Jamhuri is swahili for republic, and its a national holiday commemorating when Kenya became a Republic. On December 12th 1964, exactly one year after he bcame Prime Minister, he becomes Kenya's first President. As Kenyatta was getting older, his health started to deteriorate. He suffered a heart attack in 1966. In 1968, he published his biography, "Suffering Without Bitterness". On January 29th 1970, he is sworn in for his second term as Kenya's President. In mid 1972, Kenyatta stuns Kenyans at a rally, when he tells them that there have been threats to his life. This sends shockwaves around the country as Kenyans start pondering about their future without their beloved leader. Kenyatta stays unharmed and on November 5th 1974, he is sworn in for his third term. In April 1977, an ageing Kenyatta suffers another heart attack. At this point, Kenyans have a rough idea of where their celebrated hero is headed. On August 22nd 1978, disaster strikes. Kenyatta dies peacefully in his sleep. It has been said on various occassions that on that day, everything in Kenya went silent, as Kenyans gathered their families at home and remembered their greatest son. On August 31st Mzee Kenyatta was was finally laid to rest at the Mausoleum on Parliament Buildings, Nairobi, in a burial ceremony attended by numerous Heads of State and Royalty. Below is a picture of Mzee Jomo Kenyatta with some of his prison inmates at Kapenguria--Kenya's founding fathers who would later free her from the chains of colonialism. From left to right we have:-Bildad Kaggia, Kungu Karumba, Achieng' Oneko, Jomo Kenyatta, Daniel arap Moi, Paul Ngei, and Fred Kubai.